Thank goodness Friday is almost here! Leela agrees, she has been extra cranky this week around the other two dogs, especially when they get near her food or comfy bed. We’ve had Skipper for, wow, almost 6 months now and Leela is still not happy to have him around growling and barking when he gets too close to her. 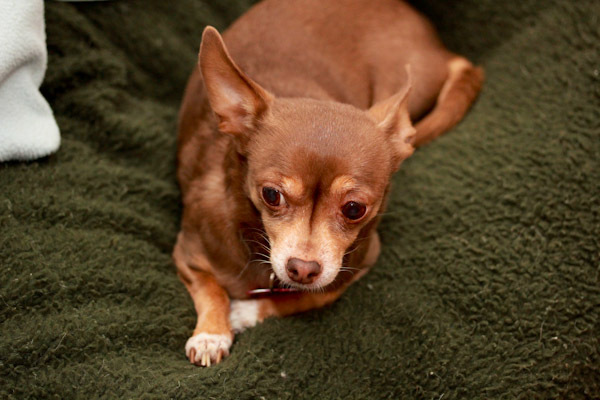 It gets tough to deal with because we want her to be happy and have been working with her, but she has emotional damage from past abuse before we rescued her that I don’t think she’ll ever get over. Miko, on the other hand, has no problems, life is just a constant party for him and he’s always ready to play and/or eat. Same for Skipper who has been full of energy lately, being blind and crashing into things has not slowed this guy down! 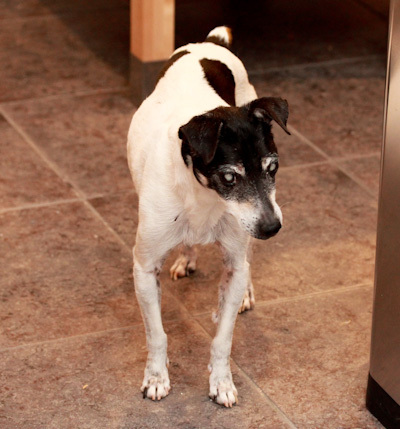 Lately he’s been spending a lot of time being a kitchen shark carefully checking every square inch of the floor for dropped food – who needs a Roomba? 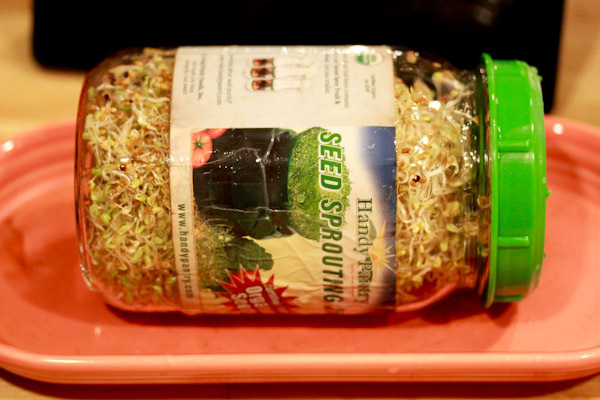 My sprout challenge for this month has been going well, I’ve gone through about 4 jar fulls of home grown sprouts adding them to smoothies and salads. And have been better about rinsing the jar at least twice a day making it a habit in the morning before work and evening while making dinner. It’s been a weird week for me, I’ve been feeling more tired than usual possibly dealing with work stress, maybe a little tired from half marathon training, and trying not to catch annoying bugs running around work and family. 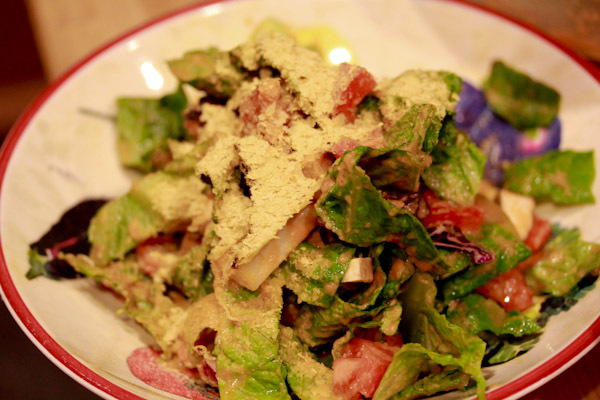 I’ve been sticking to a lot of comfort salads, like this huge romaine salad coated in Gena’s Miso Carrot Ginger Dressing. 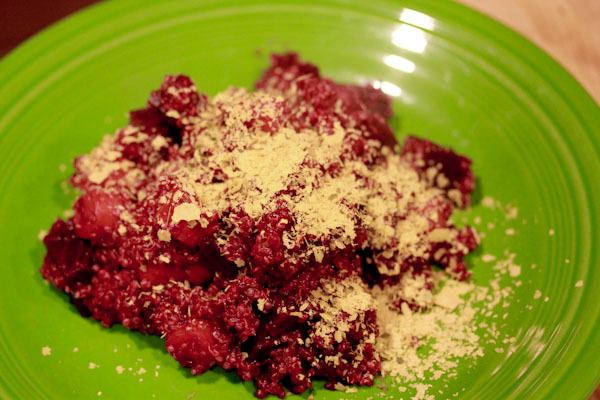 But I also tried something new using beets, and under-used super veggie in my kitchen! Beets are amazing vegetables for being nutritional powerhouses, they’re high in vitamins A, B, and C, beta-carotene, folate, iron, fiber, etc. They might also help depression with betaine, the list goes on! But they’re also a tricky veggie to work with for me because they can have an earthy, gritty texture. I pretty much only enjoy them puréed or juiced raw and even cooked recipes can be hit or miss. 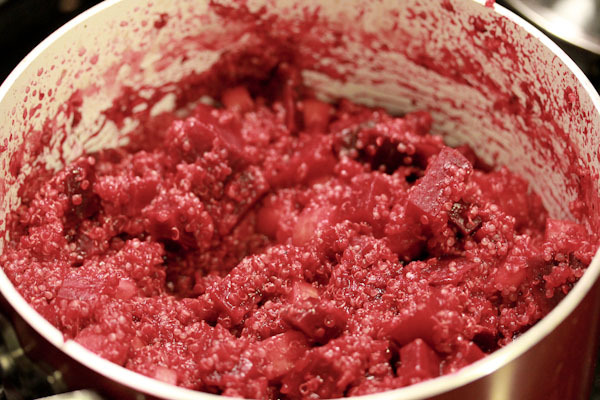 I decided to try this recipe with balsamic vinegar and found it complements the sweeter flavor of beets with a savory tang while simmering them with quinoa and carrots gave them a soft texture without having to roast them with oil. Place all ingredients into a medium pot and bring to a boil over medium high heat. Reduce heat to a simmer. 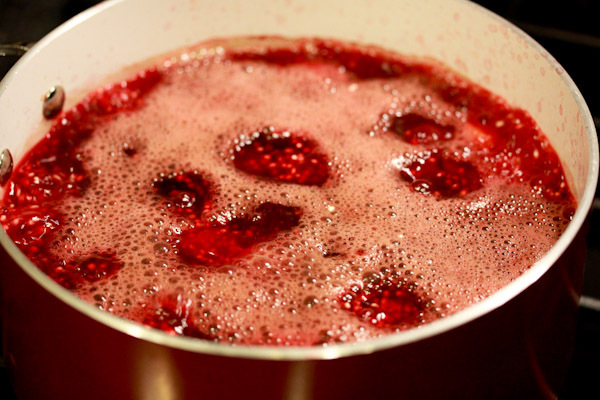 Cover and simmer for about 30 minutes, until loose liquid is absorbed, stirring frequently. Stir in salt and pepper to taste, serve and enjoy. Makes 4 servings. The strong red color in beets took over this dish quickly! And everything in the dish turned bright red, including the carrots – pretty! The flavor of this dish is very nice with a bright and tangy balsamic vinegar flavor balancing the beets with a nice level of savory. 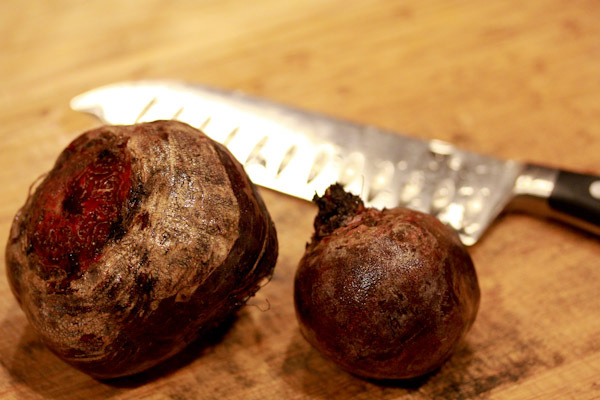 The texture of the chopped beets also worked well for me, hearty and slightly firm, but soft and not earthy. Plus it’s a very filling dish dense in nutrients, not calories. How fun for the almond milk! I get some interesting comments from co-workers when I mix them into my smoothies because of the bright color, lol. 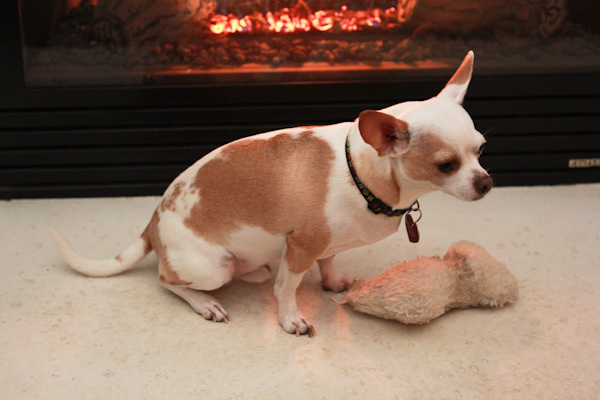 My mom’s dog does the same thing, her floors are always spotless! haha. MMM I love beets, how delicious! Too funny! It’s tough with Skipper lately because he’s blind, we have to be careful not trip over him! I really want to get into more with beets! I did get a few last summer locally and they were vibrant…but…I need to get more creative with them! This sounds like something I would LOVE. The sprouts look awesome, too! The last batch I attempted was a BUST…oh well…I will try again soon!